TechRadar Deals: Gadgets, games, gizmos and more at great prices! It's nearly the weekend, and to kickstart that Friday feeling we've put together another list of the day's best deals on tech and games from around the web. Powerline: If your house does a good job of blocking wifi signals and knocking the walls down isn't an option, you might consider buying a powerline kit which routs your internet signal through the power wires in your house. 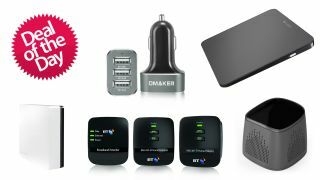 This kit from BT comes with one master socket and two adapters and is now just £79.99 at Amazon.co.uk. Wireless touchpad: Want to use Windows 8 or Windows 10 touch gestures but don't have a touchscreen monitor or laptop. No worries, get a wireless touchpad! This one from Logitech is now drastically reduced to just £19.99 at Amazon.co.uk. Car charger: And if you go on lots of car journeys with the family, it helps for everyone to be able to charge their gadgets while on the go. This car adapter will charge three USB devices at once and now costs just £11.99.